Electrical oil pressure gauges indicate engine oil pressure in PSI (Pounds per square inch) and are marked in 15psi intervals. Each marking therefore approximately equates to 1 BAR, so 90psi is approximately equal to 6 BAR. A matching ETB Pressure Sensor is required to provide the gauge with the correct input resistance. The gauges are supplied a 'U'-shaped fixing bracket and thumb nuts along with a 12v /2w illumination bulb. Night illumination is classic white. 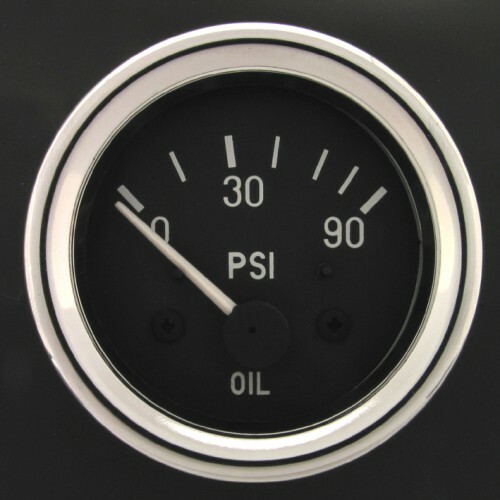 The gauge size of 52mm denotes the outer diameter of the main body of the instrument and hence a 53mm to 54mm diameter hole is required in the dashboard. 52mm Wiring diagram - Download PDF file here.